Grace and peace from God our Father and the Lord Jesus Christ be with you all as you begin this gracious season of lent. I am writing to confirm the news broad casted yesterday, Monday 11 th February 2013, that our Holy Father, Pope Benedict XVI, has resigned from his ministry as bishop of Rome and successor of Saint Peter. I feel the need of doing so because many people are confused of the news, some are dismissing them as rumours and still others are asking why the Pope resigned. These are understandable concerns. We are not used to papal resignations. In fact, the last supreme pontiff to resign his See was Pope Gregory XII in 1415. So it is possible for the Pope to resign. resigns his office, it is required for validity that he makes the resignation freely and that it be duly manifested, but not that it be accepted by anyone." This is what has happened with the Holy Father. The Pope himself has already given the reasons for his resignation in his statement to the college of Cardinals. He said: "After having repeatedly examined my conscience before God, I have come to the certainty that my strengths, due to an advanced age, are no longer suited to an adequate exercise of the Petrine ministry." There is, therefore, no need to speculate on other reasons. As the Vatican spokesman, Federico Lombardi, stated: "It was his personal decision taken with full freedom, which deserves maximum respect." What I would instead ask you to do is to pray for him and to thank him for his faithful service to the Church done with great wisdom and dedication. Some people are asking what is next for Benedict XVI. The Pope will continue to exercise his ministry up to 28th February 2013, at 20:00 hours, after which the See of Rome and of St. Peter, will be vacant. The Cardinals will then convoke a conclave to elect the new supreme pontiff . This needs your fervent prayers as well. The Pope will dedicate his remaining years to prayer. He will, as from 1st of March 2013, s=former monastery within the Vatican territory. May I ask all pastors and superiors of religious communities to take this matter with faith and to enlighten the people about this new reality. 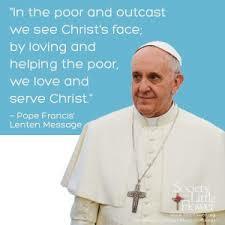 Again, I wish you a fruitful Lenten observance.